Intelligent 5-Port USB 4-Port USB-A and 1 USB-C PD 3.0 and QC 3.0 Port Charger, for phone, tablet, electronic cigarette, etc. in more than 100 countries. The universal USB docking station allows you to charge all your peripherals (laptops, ultrabooks, tablets, smartphones, etc.) and in more than 100 countries to use. The maximum charging power is 80 W.
It is the perfect accessory for the home, office or on the go. Qualcomm Quick Charge TM 3.0 technology enables fast and efficient charging of your peripherals. Ultra-slim housing with clean design. Output voltage of 3.6V to 20V universal automatic, plug & go. Intelligent security - Safety functions: overvoltage protection, protection against short circuits and overheating. 5-port USB output with a total power of 80W. 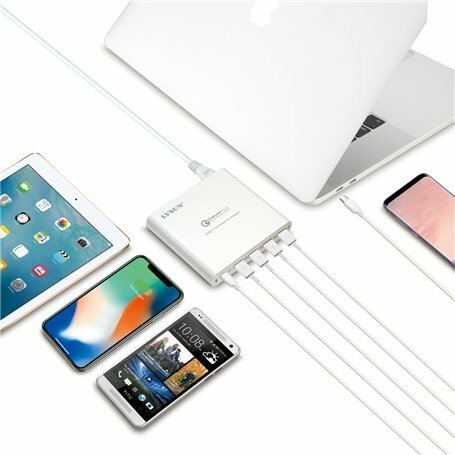 Can charge 5 devices simultaneously.